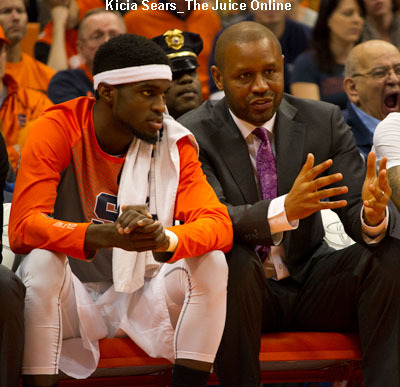 Syracuse closed both the non-conference portion of their schedule and the 2014 calendar year with a choppy 61-44 victory over Cornell Wednesday night at the Carrier Dome. Both teams struggled through an ugly first half before the Orange (9-4) opened the second half with a strong effort on offense to get some breathing room. SU made 10-of-11 shots from the field to open the second half, effectively ending any upset hopes held by the Big Red (6-7). After their slow start, Syracuse drilled 60 percent of their field goal tries after the break and finished at 48.1 percent shooting in the game. Cornell hit 5-of-8 shots to close the game, pushing their field goal shooting mark to 34.5 percent. The Orange also owned a 22-5 advantage in points off turnovers. 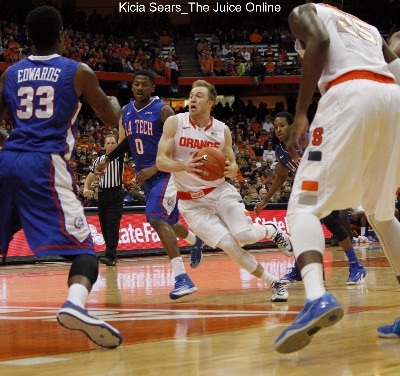 It was not all positive for SU, as they were outrebounded by the Big Red, 34-33. Cornell came into the game one of the worst teams in the nation in defensive rebounding and the Orange mustered only eight offensive boards in the game. Syracuse also turned the ball over 14 times against a low-pressure defense. The two squads combined to miss the first nine shots of the game and it took nearly four minutes for a score. Rakeem Christmas had the honors and his basket was the first of six consecutive points to open the game for SU. Cornell finally drained a jumper to get on the board, but needed just over seven minutes to score. The Big Red missed seven shots before that score and also had two turnovers for good measure. Syracuse would tack on the game’s next eight points, highlighted by Trevor Cooney’s open-court steal, which he turned into a dunk. Christmas hit a jump shot to end the run and put the Orange in front, 14-2, with just under six minutes left in the opening half. At that stage of the game, Cornell was shooting 1-for-17 from the field. The Big Red finally got their offense in a groove and actually ran off an 8-2 streak, cutting the margin to 16-10 with under four minutes on the clock. Christmas scored twice to stop the visitors’ momentum, then after a Cornell bucket, Cooney hit a three late in the half for a 23-12 lead at intermission. After a Big Red free throw opened the second half scoring, Chris McCullough gave the sedate Carrier Dome fans a jolt, throwing down a vicious contested dunk. Cooney followed that with another three and a pair of free throws, making it seven straight points and putting the Orange in front, 30-13. Shortly after that, SU pushed the margin to 22 points with a 9-2 run. After a Cornell three snapped the run, Ron Patterson came up with a steal and streaked into the frontcourt. As he neared the basket, he flipped a pass over his shoulder to a trailing Cooney, who rose up for the dunk. The Orange kept the Big Red at arm’s length after that. The lone scary moment came when Christmas scored and was fouled with under five minutes to play. The senior center motioned to the bench that he needed to come out and did so after making the free throw. Christmas seemed to be fine, but did not return. Cornell would cut into the margin a little bit before their coach sent in five walk-ons for the game’s final minute. Syracuse coach Jim Boeheim followed in kind. The mass substitution of the Orange resulted in one last high moment for the Carrier Dome crowd, as Christian White buried a three-pointer for the final points of the night with four seconds to go. Rakeem Christmas had a field day, drilling 9-of-12 shots from the floor en route to a 19-point, nine-rebound stat line. Trevor Cooney was the only other Syracuse player to crack double digits in scoring, finishing with 14. Kaleb Joseph chipped in with eight points in the game. Two Cornell players posted double figures in scoring. Shonn Miller topped the squad with a dozen points while JoJo Fallas had 11. The Orange will open ACC play on Saturday when they visit Blacksburg for a matchup with Virginia Tech. The Hokies are off to an 8-5 start on the season under new head coach Buzz Williams, who took the Tech job after six seasons at Marquette. Virginia Tech had a four-game win streak snapped on Tuesday when they were routed at #17 West Virginia, 82-51. Guards Adam Smith and Justin Bibbs are the top players for the Hokies, each averaging a dozen points per game and have combined for 48 three-pointers on 47.5 percent shooting from deep. The contest, which is set for a noon Eastern tip-off, will be televised regionally, so please check your local listings.